I am all about the princesses. I am all about the glitter. I run in hoop earrings and my work out tanks have sequins. In a nut shell I am a girlie girl and for the most part my girls follow suit. And then there is Amelia… The youngest of three who basically has to fend for herself because we are all so busy. Most kids her age like to watch Mickey Mouse Clubhouse, Agent Oso, or Little Einsteins. But not Amelia her favorite show is Power Rangers, which drives me insane. Power Rangers really??? Who even knew they were still on the air? Certainly not me! My other girls never watched Power Rangers. We spent mind numbing hours watching Barney and The Wiggles not Power Rangers. Well not only are they on the air, there are about eighty different versions of the television show on all the time on Nick Toons. If you would like to check out the Power Rangers some of your choices are Power Rangers Samurai, Power Rangers Super Samurai, Power Rangers in Space, Power Rangers Dino Thunder and Power Rangers Turbo just to name a few. Amelia’s favorite is Super Samurai but she will watch any one of the shows. 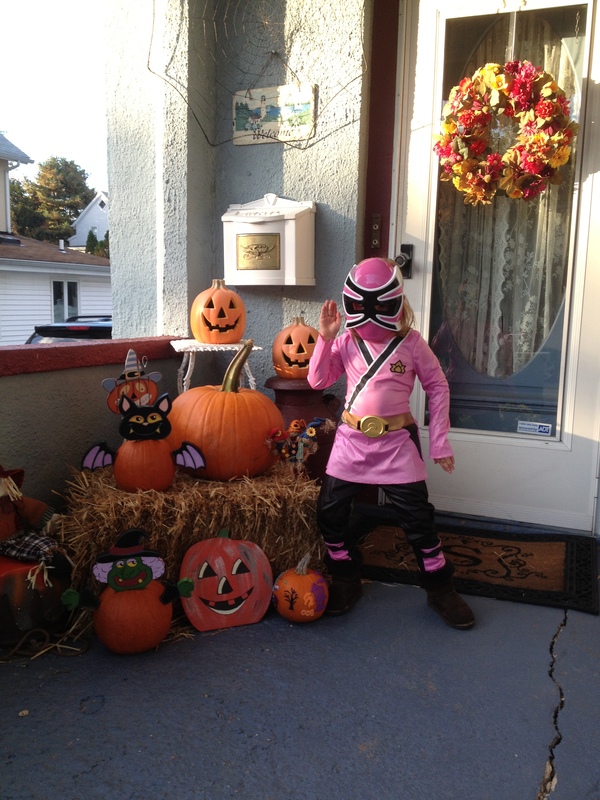 So should I have been so surprised when she asked, no begged, to be a Power Ranger for Halloween. Probably not. I tried to dissuade her with Minnie Mouse or a mermaid or even a butterfly but she wasn’t having it. In the end I had to give in because she truly does love them so much. At least she picked the pink ranger! Today we went to a Halloween Party and there was my Pink Power Ranger playing amongst all the Rapunzels, Ariels, and Cinderellas. As I watched I had to smile. I guess I have to let her be who she wants to be. I should be happy she knows what she wants and is not afraid to be an individual. This entry was posted in Family, Life, Motherhood and tagged Halloween, Halloween Costumes, Kids shows, mickey mouse clubhouse, pink power ranger, Power Rangers, power rangers in space, Power rangers samurai, Princess, Princessess. Bookmark the permalink. So Amelia right? Thanks for the compliments. Go girl power — hi-ya! Yes I believe they do! In my head I know it’s good she she likes a strong female character role but sometimes it’s hard to let go of traditional things that I like- like being a princess for Halloween. I am so proud of her that she is such and individual.And yes we need more strong female role models I agree! power rangers may be the boys thing but pink is still girlish! 🙂 An awesome costume!